Below you can view all the homes for sale in the Montbello subdivision located in Denver Colorado. Listings in Montbello are updated daily from data we receive from the Denver multiple listing service. To learn more about any of these homes or to receive custom notifications when a new property is listed for sale in Montbello, give us a call at 720-729-2320. Cozy for sure!. Well Cared for. MLS#9429267. Keller Williams Realty Downtown LLC. All Offers Due By April23 ,2019 3pm MLS#7123899. C W Realty LLC. Call for a private showing 720-590-0042 MLS#5867830. Keller Williams Preferred Realty. Must see property and will go quick at this price point! MLS#6215927. American Home Agents. Wood Floor in Both Bathrooms and Tile in Kitchen. MLS#3871346. Brokers Guild Classic. Easy fix-up with lots of potential. MLS#3772803. Brokers Guild Classic. Don't miss out on this attractive, tri-level residence. 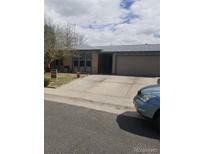 MLS#6479750. eXp Realty, LLC. Don’t miss out on this perfectly located home for your family! MLS#4051736. Adobe Realty LLC. Everything you need for living and entertaining! Quick Move In! Seller Motivated! MLS#1793242. Modern Real Estate Co. This house has an alarm system that the new buyers can assume. MLS#8647043. HeReigns Real Estate. You will love to call this property your home. MLS#9353238. Buy-Out Company Realty, LLC. Roof and gutters to be replaced before closing. MLS#1852093. COLDWELL BANKER RESIDENTIAL 56. Nice brick home with 3 bedrooms 2 bathrooms, has new carpet and new interior paint, new windows, new electrical panel, newer roof, 2 car garage with a large back yard, covered patio with a hot tub, nice modern kitchen, updated bathrooms with walk in tub, 2 large storage sheds in the back yard,close to DIA and downtown, has solar system to save you $$$ on your utilities bill, buyer needs to qualify for solar service which is approximately $52.00 a month. MLS#3612579. The K Company Realty. Come see this amazing home today! MLS#4854010. CITY PARK REALTY LLC. *** Open House Saturday April 13, 11am - 2pm *** MLS#8767162. Equity Colorado. This home is conveniently located near schools, parks, I-70, shopping &RTD rail system. MLS#1560073. VOLANTE REALTY LLC. Home has been updated with solar panels, new A/C and sprinklers. Hurry it won't last. MLS#9037189. Patrick Pink. Conveniently located with easy access to Peoria Station light rail, I-70, the CU Anschutz Medical Center and minutes from Denver International Airport. MLS#2773481. KENNA REAL ESTATE. Close to I-70, I-225, light rail and Anschutz Center MLS#3037358. HomeSmart Realty Group of Colorado. This home has it all, updated hoe, new carpet throughout, newer 6 panel doors, 3 bedroom, 2 bath, 1 car garage, double pane windows, quick closing , updated bathrooms, large back yard, bring your first time home buyers, MLS#9817762. Brokers Guild-Cherry Creek Ltd.. This property is priced to sell! MLS#6495111. Investment Management Group Ltd.
Quiet street. Close to schools and parks! MLS#2927076. MB BINGHAM & CO.
***OPEN HOUSE Saturday March 30th from 12pm to 3pm and Sunday March 31st rom 1pm to 3pm*** MLS#8618784. Megastar Realty. Be sure to check out the virtual walkthrough link with the movie camera icon under the pictures! MLS#7390662. Sage Choice Realty LLC. Quick closing Ok. Big fenced back yard. Come see it today. MLS#2234923. CENTURY 21 RECOM REAL ESTATE LLC.